Obama said he knew how to make daal and had his own recipe learnt from his Indian roommate when he was a student. 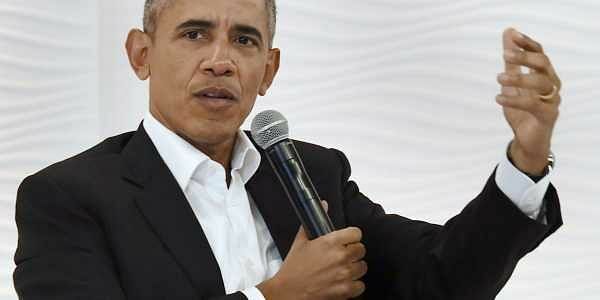 Former US President Barack Obama at the HT Leadership Summit in New Delhi on Friday. NEW DELHI: Former US president Barack Obama had the audience here in splits when he said that he was the first American president to have a recipe for daal, the humble Indian dish which is staple in many Indian households. Speaking at the HT Leadership Summit in a question-answer session, he explained to Karan Thapar that the night before the waiter who served him daal, among other dishes, began explaining how daal was made. Obama said he told him that he need not do so, since he knew how to make daal and had his own recipe learnt from his Indian roommate when he was a student. Even while he began speaking about his daal expertise at the summit, both the hand-held mikes of the interviewer and the interviewee malfunctioned. The two had to enter into off-mike small talk before it was replaced a couple of minutes later. "My keema is also good, and my chicken is OK," the man who earlier headed the most powerful office in the world said to smiles all around. When Thapar asked him whether he could make a chapati, Obama said he could not. "Chapati is hard," the man who was one of the most popular presidents of the United States said.